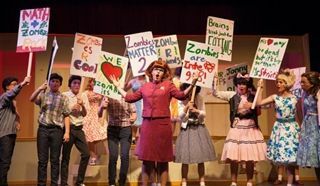 Last weekend's performances of the Middle School musicalZombie Prom were positively infectious! 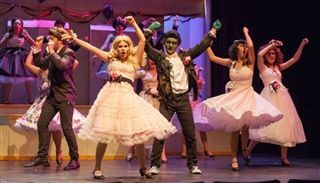 The cast and crew impressed with talent and commitment, while the show's catchy tunes, clever costuming, and colorful characters left audiences charmed. The theme of the story - that all humans (even humans turned zombies!) are deserving of acceptance - was delivered with humor and heart. Thank you to Director Steve Dziekonski, Assistant Director Bob Shuttleworth, and the many parent volunteers for their help producing another outstanding show! See more Zombie Prom photos on the Pacific Ridge Facebook page.